In recent years, it’s become clear that RNA-binding proteins play a major role in cancer growth. These proteins, active in all cells but especially so in cancer cells, bind to RNA molecules and accelerate cancer cell growth. Unfortunately, no cancer treatment has targeted these proteins. Until now. In the upcoming issue of Nature Communications, Professor Rotem Karni and his team at the Hebrew University of Jerusalem (HU) present a new technology to fight cancer. They designed decoy molecules that trick RNA-binding proteins into binding with them. Once bound, these RNA-binding proteins are no longer able to bind with the natural RNA molecules in cancer cells and lose their cancer-promoting activity. 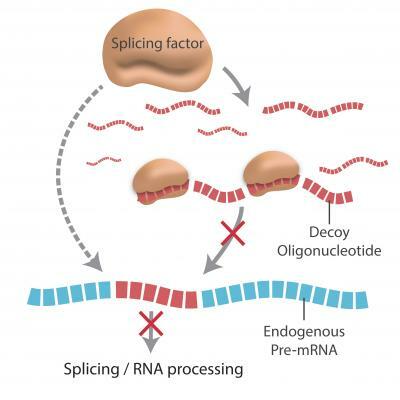 These “sterile” RNA molecule decoys are called oligonucleotides. “Our technology is a new approach in the war on cancer. By understanding the biological function of RNA-binding proteins we successfully designed decoy molecules that inhibit these proteins and move us ever closer to creating an anti-cancer drug,” shared Professor Karni. Prof. Karni and his HU Institute for Medical Research-Israel Canada (IMRIC) team, led by Ph.D. student Polina Cohen-Denichenko, developed several decoy molecules that inhibit the RNA-binding proteins that speed-up brain and breast cancer growth. To test the decoys, they treated brain cancer cells with decoy molecules. When the cells were then injected into healthy mice, the cancer cells did not replicate and, soon after, the tumors died off. To date, a patent describing this technology has been registered in the United States and Europe by Yissum, Hebrew University’s R&D company.